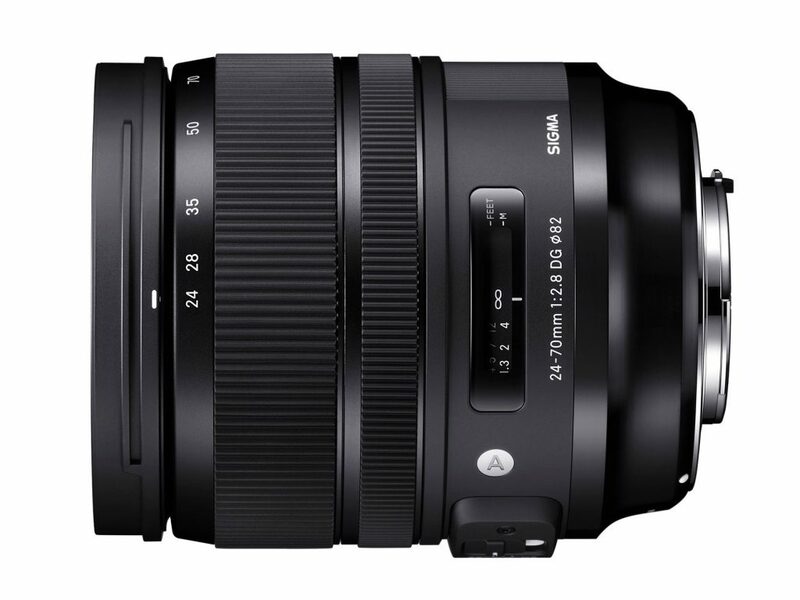 Sigma introduced the Art version of its 24-70mm f/2.8 lens in February 2017, bringing with it the familiar-looking exterior design with a mix of metal and “thermally stable composite” material, along with rubber sealing around the mount. Internally, Sigma says they’ve updated the optical construction to meet the demands of ultra-high-megapixel cameras. It has 19 elements arranged in 14 groups, with 3 low-dispersion elements to reduce chromatic aberration. In addition, the large-diameter zoom features an image stabilizer unit. Sigma is also keen to point out that it has adopted high-grade aspherical lens elements to reduce aberrations, while at the same time paying close attention to the shape of the bokeh. However, at 107.6 x 88 mm (4.2 x 3.49 in) and 1.02 kg (36 oz), it’s quite a bit bigger and heavier than the lens it replaces, which measures 95 x 89 mm (3.73 x 3.5 in) and weighs 0.79 kg (27.87 oz). With an overall score of 31 on a Nikon D810 body — one of the best performing cameras available (but now superseded by the D850), the Sigma 24-70mm f/2.8 DG OS HSM A improves upon the previous Sigma 24-70mm f/2.8 IF DG HSM model, which achieved a score of 25 on the same body. Our results show that sharpness is slightly improved overall, especially when used wide-open at f/2.8 from corner to corner and at the mid- and longer focal lengths where large-aperture zooms tend to struggle (even high-grade models). We achieved the best results at mid-range, at 35 and 50mm, but it is a good performer at the wider end as well, albeit with some astigmatism. Like others in this group, there’s a noticeable drop in sharpness at 70mm. Sigma is more active than anyone else in this space, with not only an Art series 24-70mm f/2.8, but also a faster and shorter-range 24-35mm f/2 , so it’s interesting to compare the performance of these with others lenses sharing a Nikon mount, including the well-liked Nikon model and its equally-respected predecessor. The Sigma Art series 24-70mm f/2.8 lens’s overall score of 31 on the Nikon D810 puts it 5 points behind the maker’s 24-35mm f/2, which is a noticeable margin. We expected the new lens to be closer. The two main third-party rivals from Tokina and Tamron share a similar overall level of optical quality, with the former boasting marginally higher sharpness levels when stopped down, and excellent transmission. Intriguingly, the latest Nikkor and its predecessor can’t quite match the performance of the third-party offerings, though they’re very close despite both having quite high levels of lateral chromatic aberration. In this section, we’re going to compare the Art series lens with the original Sigma 24-70mm IF EX DG HSM lens and the stabilized Nikon AF-S Nikkor 24-70mm f/2.8E ED VR. From our tests, it is clear Sigma prioritized sharpness across the frame (that is, the image field) at each focal length and aperture over outright sharpness, something that we’re seeing more frequently with modern designs. Still, we were expecting a greater increase in sharpness over the previous model. When looking more closely at the results, we can see that Sigma has gone to great lengths to achieve a more consistent level of sharpness, particularly wide-open at f/2.8. Even so, while the Art series lens consistently beats both the earlier EX model and the pricier Nikkor lens, we noticed some astigmatism (where the horizontal and vertical acutance lines aren’t always close) at 24mm, and sharpness levels drop at 70mm. The acutance profile below shows the sharpness profile of the three lenses at their longest focal length and at f/2.8. Closing down the apertures increases sharpness to f/5.6-8, whereas after at f/11, all three begin to exhibit some diffraction and score below 70% acutance. All three models exhibit some lateral chromatic aberration — and it would be unusual if large-aperture zooms like this didn’t — but the Art series model not only has lower levels, it’s mostly restricted to the 24-28mm focal lengths. Both the earlier model and the Nikkor have higher levels of aberration than the Art lens up to 50mm, and somewhat beyond for the Sigma’s predecessor. But this is mostly present in the corners of the frame and will likely only be noticeable along high-contrast edges. Software can usually remove chromatic aberration when processing RAW files, but its effect on sharpness can be difficult to correct. The graph below shows the chromatic aberration values at the three models’ widest focal lengths and widest apertures. All three exhibit lateral chromatic aberration of greater than 10 microns from around the 80% mark from the center of the image. Intriguingly, the most expensive lens of the three — the Nikkor 24-70mm — has the highest distortion at every focal length save 70mm, where it an equal amount (–0.5%) of pincushion distortion as the Art series model. The two Sigma lenses perform similarly, with the Art having slightly less barrel distortion between 24mm and 28mm and slightly more pincushion from 35mm to 70mm. However, it’s only likely to be noticeable above ±0.5% with linear picture elements running parallel and close to the edge of the frame. The graph below shows the degree of corner shading visible in images from the three lenses at their longest focal length and widest aperture (when it will be most noticeable). Both Sigma models show similar levels of vignetting at either end of the zoom, with the Art series model measuring a fraction more (-0.1Ev) than the EX model. However, the Art has a slightly larger central core and a more pronounced gradation to the darkening in the corners. The Nikkor is slightly better at 24mm, but by contrast, it’s pretty heavy at 70mm. For buyers on a tighter budget than the not inconsiderable $1300 required for the Sigma Art lens, there is an alternative. Tokina’s AT-X 24-70mm f/2.8 PRO FX lens, for example, retails at around $950. If you can accept the loss of stabilization and performance wide-open, the Tokina has an overall performance similar to the Sigma lens, yet boasts slightly higher peak sharpness, excellent transmission, and good control of lateral chromatic aberration. High-speed zooms with large-diameter aspherical lenses, not to forget optical stabilization, don’t come cheap. The Nikon AF-S Nikkor 24-70mm f/2.8E ED VR, for example, costs $2,400, and the Canon EF 24-70mm f/2.8L II USM, while cheaper, still lists at around $2199. Nevertheless, third-party manufacturers hope to recoup those costs by selling to a wider market. The Tamron equivalent, for example, sells for the same amount as the Sigma and has similar optical quality. While the Sigma 24-70mm f/2.8 DG OS HSM A is good performer and represents good value overall, it’s not quite what we expected from an Art series lens. Still, it has relatively uniform sharpness across the frame over all focal lengths, while levels of chromatic aberration, distortion, and vignetting are all well-controlled for this type of lens. In this review we have compared the Sigma 24-70mm f/2.8 DG OS HSM A lens to the previous model from Sigma and to its most direct rival from Nikon. 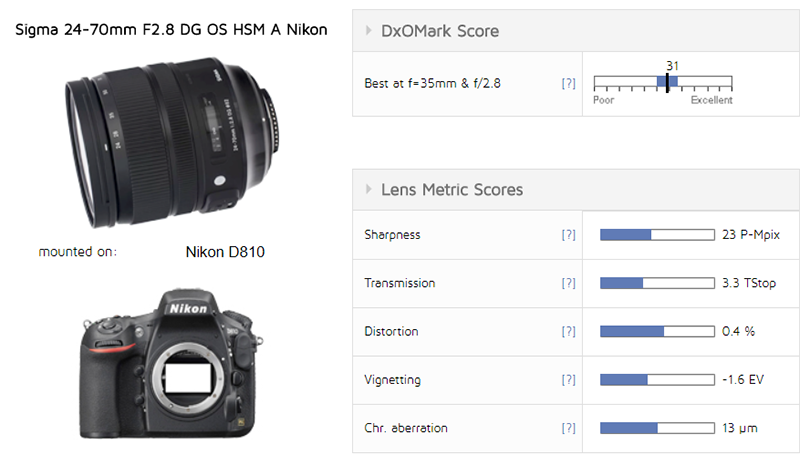 As usual, you can create your own comparisons and in-depth analyses using our interactive lens comparison tool.